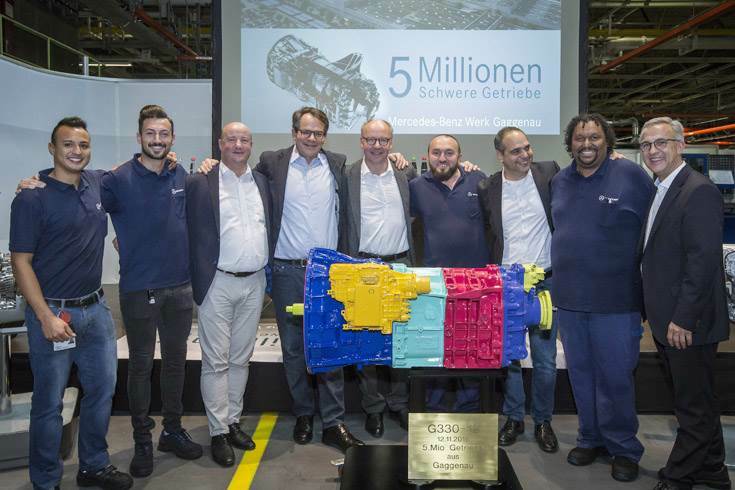 The Gaggenau (Rastatt plant) team in front of the five-millionth heavy-duty transmission, which has been colored in honour of the celebration. The Mercedes-Benz plant at Gaggenau has set another milestone in its long history. On 12 November 2018, the five millionth commercial vehicle transmission left the production line at Rastatt's Gaggenau plant. 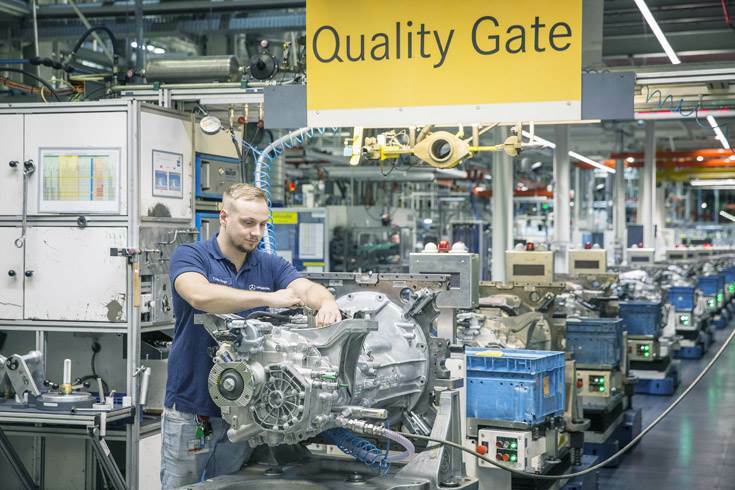 The proud production team watched the 12-speed automated transmission (G330) ceremoniously leaving the production line – which is going to be exhibited, on show at the Rastatt plant. Dr. Frank Reintjes, Head of Global Powertrain, E-Mobility & Manufacturing Engineering Daimler Trucks acknowledged this very special achievement: "Five million transmissions 'Made in Gaggenau' are an impressive milestone for both Gaggenau and our global production network: they stand for reliably high quality, for 63 years of competence and experience in the Daimler Trucks manufacturing network and not least for millions of satisfied customers worldwide." The plant located in the northern Black Forest region boasts a long tradition of producing transmissions and can fall back on a great deal of experience: the production of the first special transmissions for the Mercedes-Benz Unimog began there in 1951. Production of medium-duty and heavy-duty transmissions for trucks and buses followed in 1955. Now part of a global production network, the Gaggenau plant delivers its drive assemblies and components the world over: to the truck assembly plant in Wörth in Germany's Rhineland-Palatinate region; to the Turkish plant in Aksaray; to Brazil, Japan, India, Mexico and the USA, for example. The medium and heavy-duty transmissions from Gaggenau are fitted in seven Daimler Truck and Bus brands: Mercedes-Benz, Setra, Fuso, Western Star, Freightliner, Thomas Built Buses and BharatBenz. The medium and heavy-duty transmissions are fitted in vehicles with the greatest output. These include the Mercedes-Benz Actros, the long-distance haulage truck and the Mercedes-Benz Arocs for construction site operations, the Mercedes-Benz Atego for short-radius distribution as well as the touring coaches, intercity and urban buses from Setra and Mercedes-Benz. The international vehicle brands that are fitted with the assemblies from Gaggenau include the Freightliner Cascadia or Super Great of Fuso. Over the years and during numerous development cycles, the manual transmissions have become increasingly fuel-efficient and consequently more economic for customers. This is mostly thanks to the aluminium housing whose weight has been continually optimised. A further important innovation was the move from manual transmissions to fully-automated manual transmissions that provide for further fuel savings, particularly in long-distance haulage thanks to finely tuned gearshift processes. The automated transmissions have been produced at the plant since the 1990s. Truck and bus transmissions of the current generation weigh between 200 and 300 kilograms, are over a metre in length and house 15 individual cogs and ripples. The fully-automated manual transmissions impress with easy operation, a high degree of shifting and driving comfort as well as low fuel consumption. Highly complex manual transmissions have been produced in the northern Black Forest region since 1955 – initially directly in Gaggenau and later in the Rastatt plant. Until 1965 when the Mercedes-Benz plant in Wörth was opened, cab-over-engine trucks like the "millipede" or the round-nosed trucks were produced in Gaggenau. After that, production focussed on transmissions, axles and components for commercial vehicles and the Unimog. Whilst production of the first million manual transmissions took just over 20 years, only six years were needed for the fifth million. An overview of all production milestones since 1955: one million by 1976, two million by 1986, three million by 1993, four million by2012 and five million by 2018. For more than ten years now, Daimler Trucks has been relying on one uniform platform for the drivetrain for heavy-duty trucks. This comprises for the most part the engine, axles and transmission. The transmission generation in which production and the major components are standardised, is designed such that it can be adapted flexibly and individually to customer and market demands in the USA, Europe and Japan using the same technology. Detroit Diesel began series production of the automated DT12 transmission for the NAFTA market in 2015. In a close cooperation, staff from Gaggenau helped their colleagues with the run-up at the site in Detroit and trained them in modern production processes.